Ibiza is renowned as a destination for nightclub enthusiasts and is indeed home to some of the best establishments in the world, hosting some of Europe’s finest DJs. However, a more intimate visit with this beautiful Balearic Island will show you that there is plenty more to visit in Ibiza. Global SIM card provider, TravelSim, present its comprehensive travel guide to Ibiza. Discover stunning coastlines, fascinating historical sites, excellent cuisine and unrivalled relaxation with our prepaid SIM card service. With 300 days of sunshine a year, Ibiza is a destination that you can visit throughout the year. The peak season however begins in May and ends in late October, during which time the island’s modest 132,000 population becomes six million strong. If you wish to avoid the rush of crowds, Ibiza is much quieter and an extremely beautiful destination in early spring when almond blossom colours the coastline. If you are visiting Ibiza for its clubs, like many tourists do, there is a wealth of options to choose from. One particular venue however is the Platja d’en Bossa, also more commonly known as Space and often considered among the best clubs in the world. Inside its walls are 8,000 clubbers enjoying the sound of 40 of the best DJs in Europe. Another popular club is Privilege, the world’s biggest nightclub spanning 20 bars, including an interior pool with an exclusive overhead DJ and capacity for 10,000 clubbers. 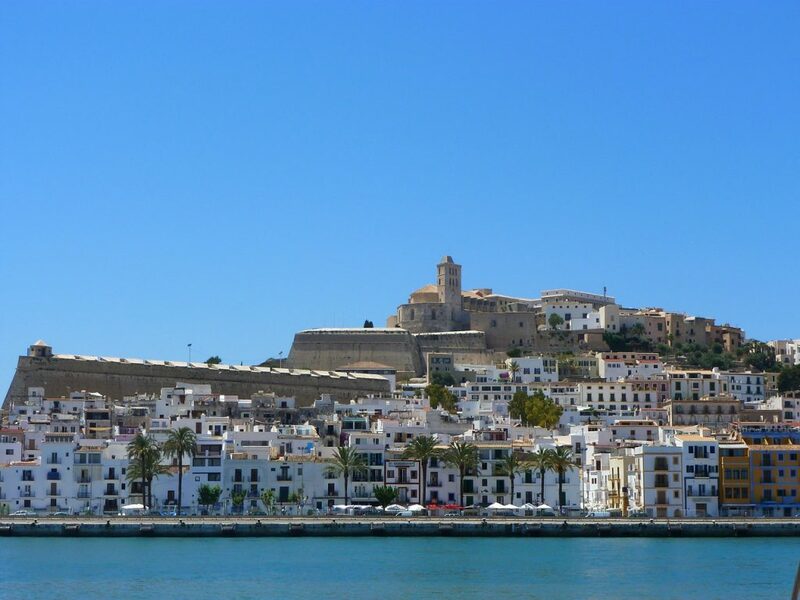 Completed in 1585, the ancient fortifications in the Plaça de Sa Font offer a unique insight into Ibiza’s past. Stroll the 22m high Renaissance era walls and enjoy stunning views along the way. Equally charming are the Ibizan ports ranging from small fishing harbours to Ibiza Magna one of the world’s most expensive ports and home to enormous superyacht vessels. As an island, Ibiza is most easily reached by plane. There are several airlines which alight at Aeroport d’Eivissa including EasyJet, Monarch, Ryanair, Thomas Cook, Air Berlin, Thomson, British Airways, Norwegian Airways and more. Services are reduced during winter and travellers may have to travel via Palma, Madrid or Barcelona. A popular mode of transport around Ibiza is scooter, useful for nipping around the small alleyways and streets of Ibiza and for driving short distances along the coastline. A hire car or scooter is recommended on all of the Balearic Islands in particular for those keen to explore the more remote, quieter beaches. There is also a reliable bus service. Ibiza bus goes from the airport to several of the island’s towns and villages for a reasonable fee of around €4.30. A Discobus service also operates between Ibiza’s various clubs between June and September.